Five photos of the station and hotel built by the London & North Western Railway on Dublin's North Wall quay, seen 90 years after they closed. Former LNWR station and hotel, North Wall, Dublin, 10 May 2012. Looking east along the Liffey. The station (nearer) and hotel are the red brick buildings at left. 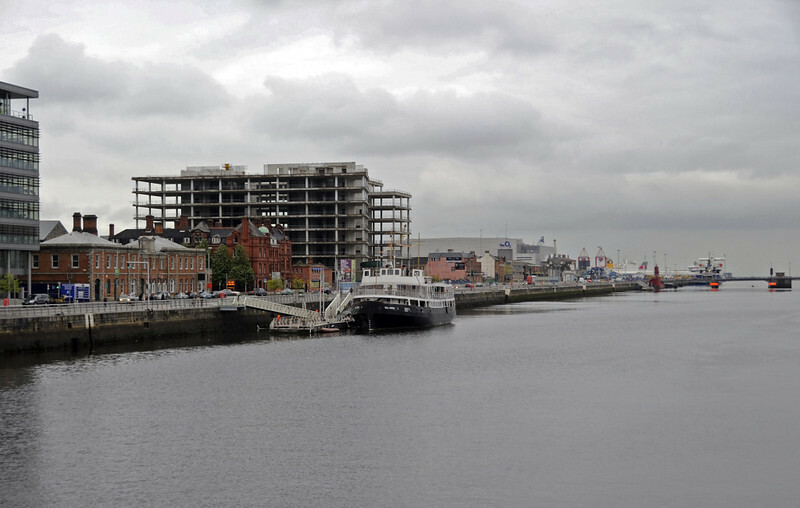 The North Wall quay used to be Dublin's port, from which ferries sailed to Britain. The London & North Western Railway ran a prestige route to Holyhead, from where its trains (including the Irish Mail) ran to Euston. Trains ran from its North Wall passenger and goods station (opened 1877) onto the Irish rail network. The passenger station was only used for boat trains. The hotel opened in 1884. In 1922, Holyhead passenger services were transferred to Dun Laoghaire, although railway-owned ships continued to call at North Wall for cattle and cargo. Other companies also continued to run passenger services from North Wall, The hotel also closed in 1922, and has been used for offices by the LMS, CIE and Iarnrod Eireann. The ship is the preserved Cobh tender Cill Airne (= Killarney), now a restaurant. Today's Dublin port is at the mouth of the Liffey, where a ferry can just be seen in the far distance at right. Cadet Gerald Alfred Body Was shot by the IRA at The London and North Western Hotel, North Wall Quay, Dublin. The attackers having mixed with the dockers at apprx. 9 am on the 21st april 1921, while on sentry duty. He managed to get inside the hotel and raise the alarm, before being transported to hospital with a leg injury.